"You should never wear a red shirt with black polka dots because your friends will call you a lady bug." You have sworn you wouldn't commit to anything for awhile.. When Heather Bluhm announced on Chubbyville a polka dot themed fat book, that would be circular in shape.. and utilize the 7 Gypsies Circle Book (Shosh, over at Hannah Grey was kind enough to offer us the book kits at and incredible price -- Thanks Shosh!) ... Despite a very quick due date, I didn't just jump, I asked how high! What did i find just sooo tempting? It is not only an original concept; but a shape that I have yet to really tackle... quality materials will be used as the base.. and really, the little girl in me was uber thrilled at the chance to play with polka dots! Since this is due at the end of May, and I will be traveling for almost the next 2 weeks, I needed backgrounds that weren't quite as time consuming as my hand painted ones are. I haven't played with paper collage alot recently, in fact I've gotten so far away from it.. this was just the project I needed to delve back in. Arming myself with a new Xyron Adhesive Runner and plenty of the permanent refills (I never use these kind of adhesives, can ya believe that? )and an array of awesome, polka dot decorative papers that I had stashed in my not-so-little paper collection... I began the process of coordinating the papers, and quickly fell back into the familiar lull of paper collage. I didn't realize how much i missed working with and matching up pretty papers! 1) Apply your permanent adhesive along the edges of the blank circle (in the 7 Gypsies Kit), then a few strips crossing in the middle. 2) Press paper to the circle, and using a bone folder or other burnishing tool.. burnish it well, paying close attention to the edges. 3) Using sharp scissors, trim the paper as close to the circle edge as possible. 4) Sand the edges, so that the circle edge remains smooth. 5) Use an eyelet setter, or hole punch to reveal the smaller, binding circle in the template. 6) Roll a small piece of sandpaper up and sand those edges. 7) Repeat this process with the other side. 8) Ink those edges! Use a brush tipped marker to ink up the binding hole. While I still prefer my painted backgrounds -- this has been a much needed, refreshing break from my norm. It's definitely more expensive, but I could have cut costs if I had more free time available. I haven't a clue as to what I will do for the composition yet --I rarely plan out my work... it always takes on a life of it's own, which frankly.. is part of the charm to me. All I know, is I am not quite ready to cover up the yummy papers! P.S. 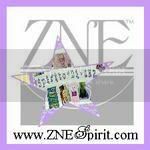 Did you see I was featured as the Spirit of ZNE this week? Thanks Chel! ZNE members --be sure to leave a comment, as you'll be entered into a giveaway contest!